And yet surely to alchemy this right is due, that it may be compared to the husbandman whereof Aesop makes the fable, that when he died he told his sons that he had left unto them gold buried under the ground in his vineyard: and they digged over the ground, gold they found none, but by reason of their stirring and digging the mould about the roots of their vines, they had a great vintage the year following: so assuredly the search and stir to make gold hath brought to light a great number of good and fruitful inventions and experiments, as well for the disclosing of nature as for the use of man’s life. 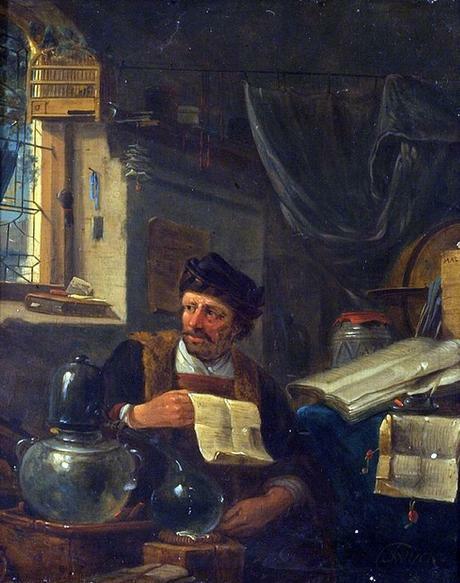 Dr. Larry Principe, professor of the history of science at Johns Hopkins, on his favorite painting in the collection of the Chemical Heritage Foundation, The Alchemist in his Studio, by Thomas Wijck (1616–1677). As we trouble ourselves with transmutation, we might send swinging birthday greetings to Jean Bernard Léon Foucault; he was born on this date in 1819. 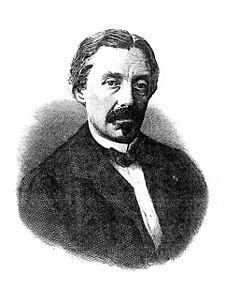 One of the most versatile experimentalists of the nineteenth century, Foucault was a physicist made early measurements of the speed of light, discovered eddy currents, and is credited with naming the gyroscope (though he did not invent it). For all that, Foucault is surely best remembered for the “Foucault Pendulum,” with which he proved that the earth rotates on its axis.